We’re nearing winter’s peak here in peaceful Durango, Colorado, which means it’s time to start planning your upcoming snowmobiling, cross-country skiing, or snowshoeing trip to Pine River Lodge. We have over two dozen Durango cabin rentals overlooking serene Vallecito Lake in the heart of Colorado’s lush San Juan National Forest on the edge of the Rocky Mountains. There’s a seemingly endless winter playground available here for outdoor enthusiasts aching for a snowy adventure. Most out-of-state tourists only know about Colorado’s world-class alpine skiing, but we have so much more to offer! Think outside the box this winter with a family snowmobiling, cross-country skiing, or snowshoeing adventure near beautiful Durango, Colorado. Pine River Lodge has easy access to dozens of breathtaking snowmobiling trails, which should come as no surprise. Both the San Juan Sledders Snowmobile Club and the Silverton Snowmobile Club meticulously groom their paths, which span hundreds of miles. The Vallecito Middle Mountain Road can be picked up on the north end of the lake, only a short trek from the lodge. 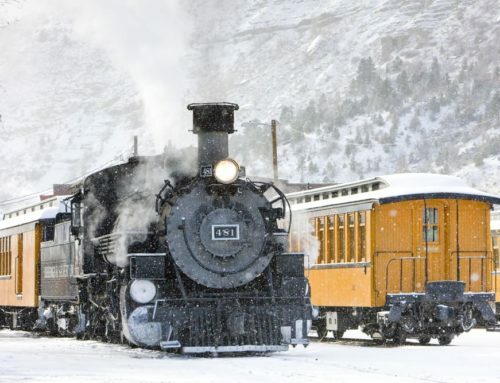 Lemon Reservoir and Missionary Ridge are two nearby trails worth exploring, but you’re also free to try backcountry sledding – just make sure to read Durango’s safety tips and park guidelines before riding. The Vallecito Nordic ski trail is officially up-and-running as cool temperatures and snowfall have finally arrived here at Pine River Lodge. Our Durango cabin rentals are less than three miles from the trailhead. For those of you who don’t own cross-country skiing gear, please visit one of these local establishments located in nearby Durango. These diligently-groomed cross-country skiing trails span over 12 kilometers, cruising past Vallecito Lake and lush forestry at the foothills of the Rocky Mountains. Pine River Lodge gladly provides our guests with snowshoe rentals for all ages! You’re encouraged to explore our lakefront property and the surrounding wilderness. Elsewhere, trekking deep into San Juan National Forest will provide an excellent challenge for seasoned snowshoers who’ll love these three adventures: Animas Mountain, Castle Rock, and Smelter Mountain. Many of our Vallecito Lake cabins are discounted this winter (buy two nights, get one free until April 15). Take advantage of this excellent deal before we change our minds! After each full day of exploration, retreat to your Durango vacation rentals for a relaxing, cozy evening. Whip together a home-cooked meal, gather around the fireplace, and share stories of the day’s adventures. Give us a call today at 1-970-884-2563 to book a well-deserved escape into the peaceful Rocky Mountains!